If you have the flexibility to fit a gable roof model in your backyard it will give you more room to work in your shed and for storage. In this EasyShed, the ridge beam forms an integral part of the construction and increases strength and stability. Shed comes in a variety of colours to choose from. 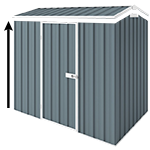 Don’t forget to check out the available accessories that you can add to your shed to customize it to your needs.